Discussion in 'UFOs, Aliens, Monsters, and the Paranormal' started by Starman, Jul 7, 2018. 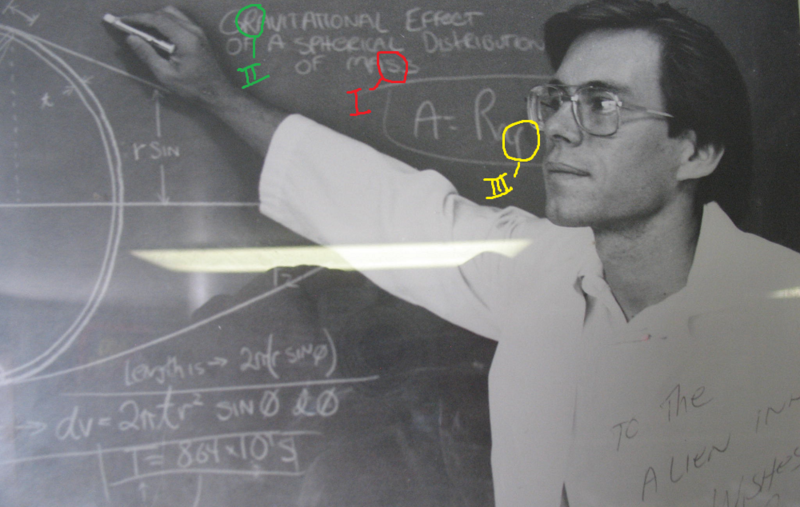 In a 2015 interview with George Knapp, Bob Lazar makes a drawing of the S-4 facility doors. The doors Bob Lazar described and drew were not in the middle of the hangar wall, they were up in the far corner in a straight line. Is it even possible to see through that many doors in this described angle (check the photo and video as well) and observe what it is inside, in every different hangar bay ? I think it is impossible. No human eye can see straight through those small doors and clearly see what is inside each hangar (there were 9 hangars). Even if he saw the edge of the first object, all others should be in parallelly and not visible. Interviewer - "when you are inside can you see all the hangar doors, or you can only see all 9 of em or whatever it is from the outside?" B.L. - What do you mean ? Interviewer - If you are inside looking in 1 hangar, can you see all the way down? See all of them, see more? or is there seperators? B.L. - Is that making any sense ? (jokes) so the door's here ...where this is.... you know Papoose Lake [indicates in front of bay doors], the main doors here roll up, however inside there are regular doors and on one ocasion these doors were all open and when i came in into the ...came in though here first...well i think the first time they showed me... well there is the craft in there. B.L. - These doors were yeah...these doors were all open and you can see that there were different craft in each so those are the doors i'm talking about. this pic was posted in 2012 (before your interview). It was supposedly drawn by Lazar and the original source link is attached to the post. 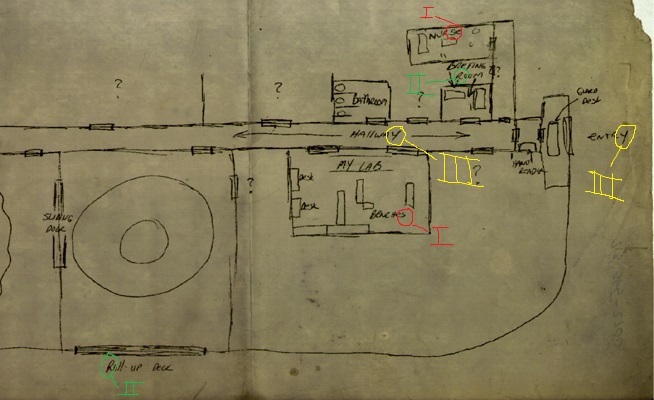 Following are a few of the sketches Bob faxed over the years to JFI in order to help illustrate the the hardware and events of Sector Four on the Nellis Air Force Range. the handwriting says "sliding door"
I'm not sure his inability to draw a side perspective (2015 interview) accurately is really proof of anything. he does put his little spaceship way in the back of the hangar as well. Are we certain, this drawing belongs to Bob Lazar ? That is a discrepancy in his storytelling. 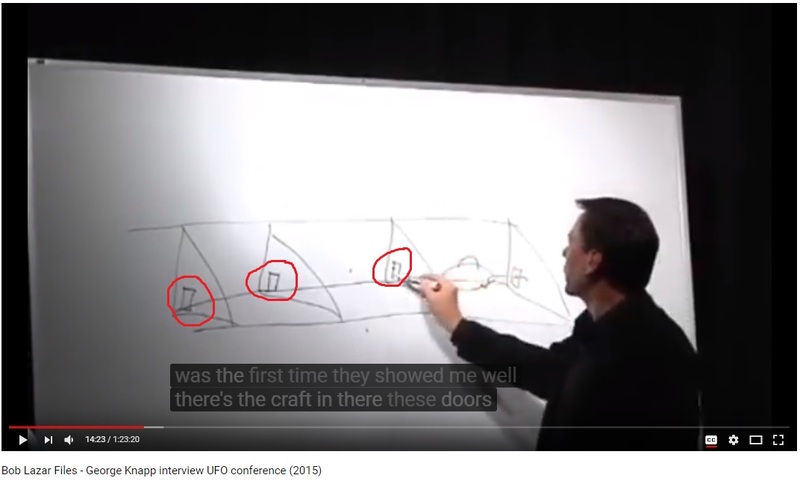 In this 2015 inerview, he was saying "the main doors here roll up, however inside there are "regular doors" and on one ocasion these doors were all open and when i came in into the ..."
He is telling about 9 hangars, all "regular doors" in his latest drawing are lined up. Why anyone wants to put these objects in front of the doorways and block the passage ? they can simply move them closer to "the main doors". If we are talking about (picture you've posted). The other object, which is barely seen, totally covers any visibility. But if they are really flat and low objects, you can see threw (honestly, i don't think this is the case). Anyway it is hard hypothetically to suggest how those objects looks like in 2-dimensional drawing. I couldn't find anything on "jfi.net" in the Wayback Machine. JFI apparently means "Jon Farhat, Inc". although that websites appears to be owned by Jon Farhat as well. It does seem Jon and Bob are 'business partners' of some sort. I'm very unfamiliar with Lazars story though, Im sure you can find more info on the relationship between Lazar and Farhat. I think the exact alignment of the doors and line of sight is a bit of a moot point, since they both come from his claimed recollection. 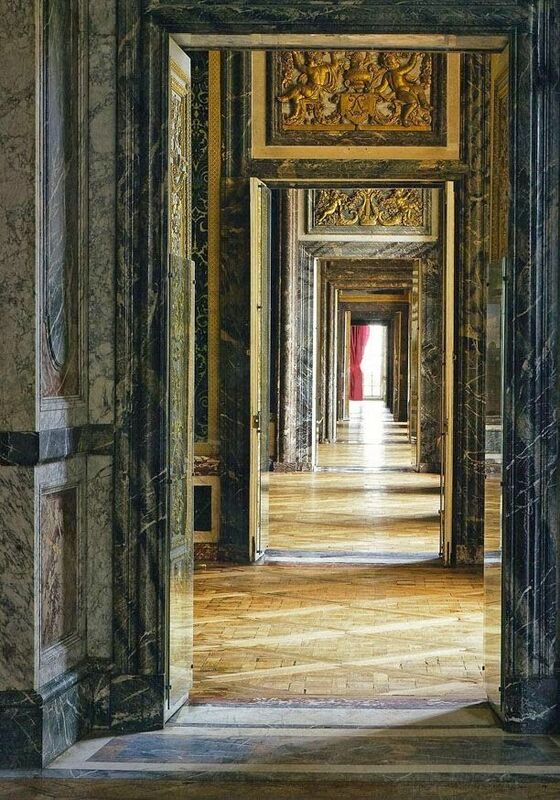 If he recalls being able to see through several doors, then that's how he recalls seeing the doors. It's not difficult to arrange a line of sight so you can see stuff. More of an issue is that he also recalls seeing exotic craft in each hanger. That's what's really lacking evidence. Anyway, i think that is the case. It is Bob's drawing. I looked in other handwritings of him. I'm not a graphologist, but some letters looks very simillar or almost identical compared to handwritings in 2012 and 1990's pictures. First of all, i don't think his story has inconsistency. In this 2015 inerview, he was saying "the main doors here roll up, however inside there are "regular doors" and on one ocasion these doors were all open and when i came in into the ..."
Now as i see in 2012 picture, it's clearly written "sliding doors". Also, he draw them in different shapes. Another thing, if you want to see all objects in all of those hangars. They should be at least not the same size (flying saucers). Otherwise, they gonna cover each other, just like you see in the picture. I was wrong (my imagination included). You are right. Just to play devils advocate. Does he say he only saw in the hangars open on one specific occasion . Or could he have seen them open multiple times and been walking around to look in each one? Yeah I hadn't listened to it when I first wrote that. It likely never happened though.. I don't wanna go too much in the story. He has extraordinary claims with no evidence to back it up. I'm really a fan of ufo/aliens stuff. Read many articles, watched many videos, read couple of books. Always looking for errors and Bol Lazar has them. If he worked with simple people (not from army), i find it legit.